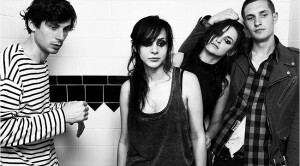 A band that’s on the verge of blowing up, Los Angeles-based Dead Sara got a break when Muse drummer Dominic Howard talked about how much he liked the band’s hard-driving single “The Weatherman” during a radio interview. Dead Sara singer Emily Armstrong and guitarist Siouxsie Medley heard the interview and immediately called their management who then coaxed Muse into taking the group on its U.S. tour. While the band’s hard-rock approach might not seem like it would go over that well with Muse fans, the band’s album features a diverse array of songs that alternately evoke Hole and Fleetwood Mac. Guitarist Siouxsie Medley recently phoned in to talk about the upcoming tour. When did you adopt the name Siouxsie and was it in homage to Siouxsie and the Banshees? It’s not. I started spelling my name like that when I was probably 8 or 9. I have a small amount of Indian in me. I remember learning about the Sioux Indians and I thought it was cool and it’s a tribute to my heritage. Later, I found out about Siouxsie and the Banshees and I thought they were awesome, so it worked out well in the end. You played a few Warped Tour dates last summer. Who was your favorite band on the tour? Personally, the band called Bangups from Grand Rapids, Michigan. They ‘re awesome. They’re a two-piece blues band. They’re awesome guys and I love them. You play really aggressive hard rock, but The Airport Sessions, which came out in 2008, is much mellower. Talk about what made you want to change musical directions. The Airport Sessions were professional demos we were doing. At the time, we had label interest. We weren’t even a whole band. It was just Emily and me and we had hired some drummers and bassists to record for us. Those were just the songs we had. We were still discovering our sound and just writing a lot and got thrown into this crazy industry world. They wanted us to do demos and all this stuff. We recorded them and were trying to find out what we wanted. That was it. We figured we’d put ’em up on iTunes so we did that. It wasn’t anything we were too solid about. Every once in a while, we’ll break out one of them for those fans who have been around sine that time. “Sorry For It All” was on that record and made it to the album. I know your singer has cited Stevie Nicks as an inspiration. Would Stevie still like the band now that it’s so heavy? I think she could appreciate it. She did that whole Sound City project with Dave Grohl. I think she has some heaviness in her soul. Is “Weatherman” about a serial killer? No. It’s really about predicting your future. What you do today has consequences for tomorrow. The chorus is “go for it” and “go for the kill.” There’s some political things in there throughout the song. That was the first song we wrote when the guys joined the band. Emily just started singing “I’m the Weatherman” over and over. At first she wanted to change the lyric. We were told her “no” because it sounded so cool. It just kind of stuck. She had to get creative and write around that concept. [Emily’s] never been unable to sing. I don’t know understand how that’s possible. She’s an alien. She’s incredible. Emily’s vocal performance on that song is incredible. Doesn’t it make her hoarse? Honestly, it hasn’t been bad at all. She’s self-taught. She taught herself how to sing. She’s had lessons since but her range is incredible. She goes on vocal rest when she needs to. She’s never been unable to sing. I don’t know understand how that’s possible. She’s an alien. She’s incredible. She was writing songs before I knew her. She started writing songs when she was like 12. I met her when I was 15 and we instantly started writing together. We have a plethora of songs. The album is heavy but not all heavy. It’s really diverse. We have many different influences, from Refused to Fleetwood Mac. We just write whatever moves us at the moment. Some tunes remind me of Hole. Were you a fan of that band? I love the early records and Emily was a fan early on. I read there’s a feature-length film being made about the band. Is that true? We have a friend who has been documenting a lot of our early performances and everything that happened to help us break as a band. We just want to record everything and have as much footage as we can. Who would be your favorite guitarist of all time? I have so many. I love different styles. I love Tom Morello and Lindsey Buckingham and Prince. I love blues guys like Bukka White and Robert Johnson and Charley Patton and Sly. I’m all over the place and draw inspiration from many different guitar players. My old nanny who taught me how to play guitar when I was 8. There’s not too many out there.